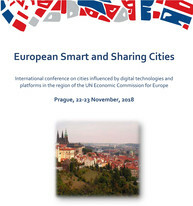 International Conference "European Smart and Sharing Cities"
The Ministry of Regional Development of the Czech Republic, in cooperation with UNECE and the Fakulta architektury ČVUT v Praze, is organizing the international conference “European Smart and Sharing Cities” in Prague on 22 and 23 November 2018. This conference will address how digital technologies and platforms have an influence on cities in the UNECE region. Digital technologies and online platforms increasingly influence the quality of life in cities. The internet of things and, at the same time, sharing of properties, cars, services, etc. are new phenomena, changing not only the way of thinking of citizens, entrepreneurs and politicians but also their behaviour. Sharing economy concepts radically change consumer behaviour as well as the delivery of services from entrepreneurs. 4. Discuss regulatory frameworks, and roles and responsibilities of national and local governments. Detailed information about the conference, including logistical information, can be found in the attached information document and on this website https://www.mmr.cz/essc. To register, please fill in the online form found on the said website by 9 November 2018.